The factors that sent the Turkish lira plunging by around 20% in 24 hours last week go well beyond the tariffs imposed by the US administration in retaliation for the detention of an American pastor accused by Turkey of spying and terrorism. The tariffs were just the trigger for the panic in the markets. More profoundly, we are seeing the unravelling of 16 years of populist policies by President Recep Tayyip Erdogan’s party. Basically, his luck – which lasted much longer than it should have had, considering his policies – seems to finally have run out. Erdogan’s party came to power in 2002, having promised (and for a while, having delivered) sweeping reforms that would improve Turkey’s economy. Indeed, his party presided over an extraordinary economic boom, which turned the country into a hub of economic activity in the region. While he took all the credit for it, he also used the long streak of economic growth to tighten his grip on power and impose religious and political restrictions that became stricter as time went by. But Turkey’s prosperity has been standing precariously on quicksand. Apart from its unique position as a trading node between Europe, the Middle East and Asia, the country doesn’t really have an edge. No physical resources, no particular expertise in any industry (apart perhaps from commerce, and tourism – both sectors largely dependent on foreigners’ goodwill) and no technological innovation of note. Its economic boom owes as much to extraordinarily low interest rates, if not more, as it does to Erdogan’s reforms. And the reason why the Turkish lira took such a beating last week and has been so weak the whole year is the short-term debt in foreign currency. With global interest rates increasing, that debt is looking worse and worse. At the end of May (the most recent data available) Turkey’s short-term external debt stock had risen by 4.8% compared to end-2017, to $123.3 billion. Of that, 50.9% is in US dollars, 31.5% in euros, 14.8% in Turkish lira and 2.8% in other currencies, according to central bank data. 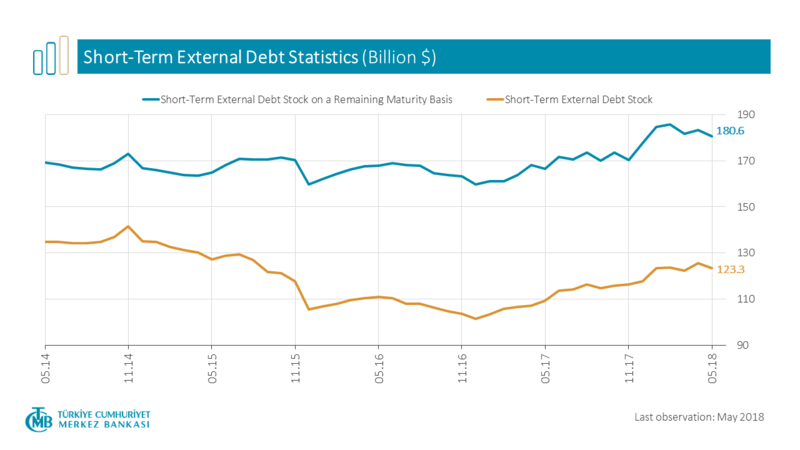 The short-term external debt stock on a remaining maturity basis — calculated based on the external debt maturing within one year or less, regardless of the original maturity – looks even worse, at $180.6 billion. That makes up around 20% of the country’s GDP – not that bad, but a sudden problem if nobody will want to roll it over. Around 80% of that debt was incurred by the private sector – in other words, Turkey’s growth miracle has always depended on the willingness of foreigners to roll over their loans. As long as interest rates in Western countries were low, that looked like a win-win proposition. But with the Federal Reserve shooting the starting gun of the race to normalising monetary policy, the game is up for Turkey. Erdogan could not have picked a worse moment to rage against “foreign conspiracies” trying to undermine his country, and against interest rates. The markets looked at that pile of debt and wondered how long the lenders could extend and pretend. They were tipped over by Erdogan’s unwillingness to tackle the real economic challenges. Those who think Turkey’s situation is unique and that we should not worry about the trouble spreading should think again. Like Turkey, many populist governments have been making promises that they are now finding they cannot keep. Rising interest rates in the US will exacerbate these problems.